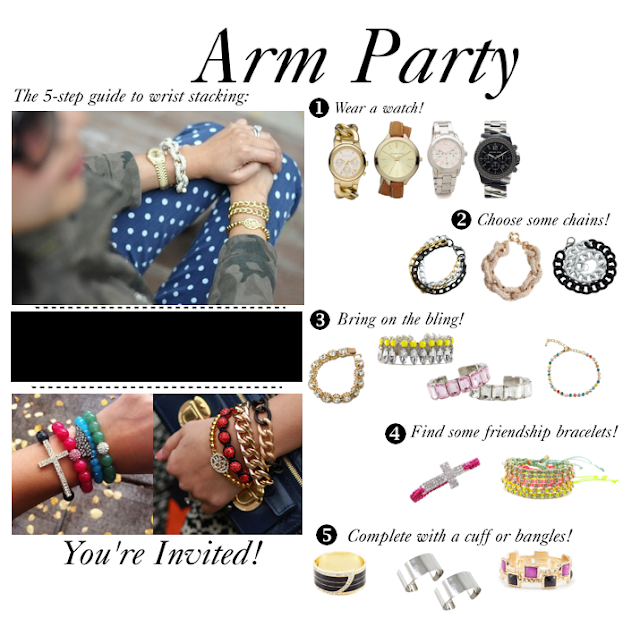 We love the idea of an “Arm Party”! Sometimes it is just too hard to choose which bracelets you want to wear, so why not pile on all of your favorites and throw a bracelet bash yourself! This 5-step guide to wrist stacking is the perfect way to compile your bracelets without over-crowding! We chose to feature Michael Kors watches in the first step…aren’t they to die?! Stick to one or two of these. The second step moves on to chain-link bracelets. These are on-trend & are easy to mix and match! We couldn’t forget the bling, of course, which brings us to step 3! Adding some sparkle is the perfect way to incorporate a feminine touch! And who doesn’t need a little glam in their life? We love step 4, as it says to throw on some friendship bracelets! These bright, rope-esque bracelets are a fun way to add a few colors to your wrists while maintaining a cool DIY vibe! To complete this look, step 5 recommends adding a big cuff or bangles. This helps to bring in a bigger metallic piece to work around the smaller options from previous steps! Don’t be afraid to mix different types of metals & try out trendy pieces! Party’s are all about fun, so enjoy taking these steps to create your own, individual, wrist stacked look! Love the t+j accessories featured above? Find them here! Hi Shannon, can you please stop uploading random pics that for some reason show up on my blogger feed as new posts? I usually get several in a row when you do this, and it's just a bit annoying to go through. Thanks!